Ways to make technology work for you as a dad. Sometimes it seems like modern technology is an enemy of good parenting and happy family life. Distractions are everywhere, and the impulse for the family to drop down online rabbit-holes and detach is ever-present. Still, modern technology is part of our lives, and it’s going to be part of our kids’ lives, too; it’s up to us to model a healthy relationship with these valuable tools, using them to be better dads and better men. With creativity and good sense, you can make technology a help rather than a hindrance to your job as a father. Here are some solid, affordable apps to get you started. Whether you’re interested in home-birth, or just want to take an active role in your children coming into the world, this is a great “dad app”. When your baby is coming, it’s good to be able to help wherever you can. With a simple stopwatch function, it lets you record the length of each contraction as it happens, and maintains a running average so you can see if the contractions are increasing or decreasing over time. You can also record intensity on a scale from 1 to 10 (Mom will have to take care of this part, obviously), so you can chart whether the contractions are growing stronger or weaker. If you have a different smartphone, there are other pregnancy and childbirth apps available for download via T-Mobile broadband for your Android or Blackberry phone. This little app uses your smartphone’s accelerometer to provide digital carpentry tools for any woodworking project around the house—hand-crafting a new crib, building a tree-fort for the kids, or any other traditional dad project. The iHandy Carpenter can simulate a plumb bob, a surface level, a bubble level bar, a steel protractor, and a steel ruler (which slides to measure things much larger than the phone), so you can ensure quality work, whatever the task. It’s accurate, attractive, and as easy to use as the real tools. There are countless free storybook apps available for smartphones and tablets that allow you to inexpensively share the classics with your small children. Many of these come with multilingual voice and text functionality, so you can expose your kids to new languages and tales from other cultures every night before bed. Most of them cost nothing, and they provide an opportunity for quality bonding and learning time with your kids. If you allow your older teenagers to have cell phones, this little app enables you to give your kids more autonomy, so you can worry a little less about their whereabouts. Use your child’s cell phone to give the app tracking permission, and it will give you a constant handle on their location, including their movements in the last four hours. It might sound sneaky, but as a dad, you’re responsible for your kids always, not just when they’re in sight. It’s a great tool to give your teenagers freedom and responsibility while making sure they are safe. In the event of a natural disaster or family emergency, this app is especially useful—you’ll be glad to know instantly where your family is and how to reach them. 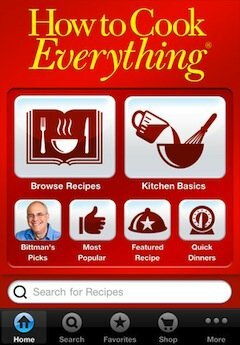 This is the perfect app for dads who are not great in the kitchen, but would like to be. With access to 2,000 recipes and variations, and built-in cooking timers that track each step of the process, you can start preparing great, healthy meals for your family right away. It also helps you organize a grocery list and budgeted meal plans so your family can live well and avoid waste. It’s a little pricey for an app, but given the money you’ll save, and the satisfaction of making something delicious for your family to enjoy, it’s worth it. I’ve got to take advantage of these apps…there’s just NOT enough time in the day! I just got an iPad – now I have to learn that, too!